Human footprints found off Canada's Pacific coast may be 13,000 years old, according to a study published March 28, 2018 in the open-access journal PLOS ONE by Duncan McLaren and colleagues from the Hakai Institute and University of Victoria, Canada. Previous research suggests that, during the last ice age (which ended around 11,700 years ago), humans moved into the Americas from Asia across what was then a land bridge to North America, eventually reaching what is now the west coast of British Columbia, Canada as well as coastal regions to the south. Along the pacific coast of Canada, much of this shoreline is today covered by dense forest and only accessible by boat, making it difficult to look for the archaeological evidence which might support this hypothesis. In this study, the research team excavated intertidal beach sediments on the shoreline of Calvert Island, British Columbia, where the sea level was two to three meters lower than it is today at the end of the last ice age. The researchers uncovered 29 human footprints of at least three different sizes in these sediments, which radiocarbon dating estimated to be around 13,000 years old. Measurements and digital photographic analyses revealed that the footprints probably belonged to two adults and a child, all barefoot. The findings suggest that humans were present on the west coast of British Columbia about 13,000 years ago, as it emerged from the most recent ice age. This finding adds to the growing body of evidence supporting the hypothesis that humans used a coastal route to move from Asia to North America during the last ice age. 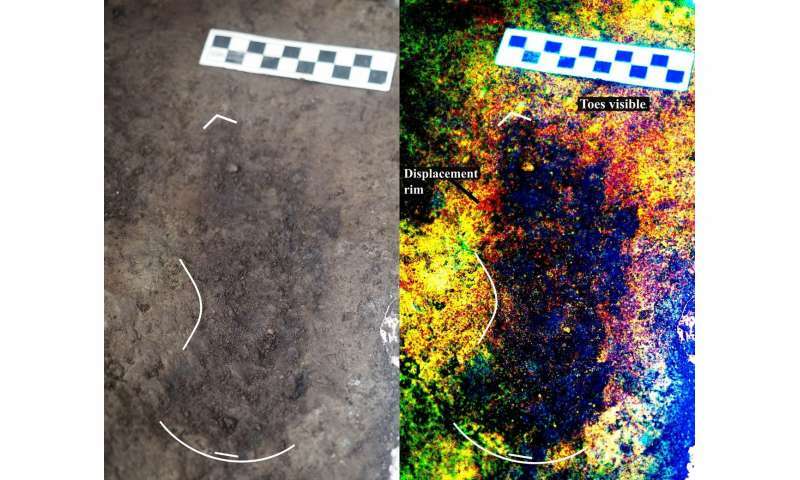 The authors suggest that further excavations with more advanced methods are likely to uncover more human footprints in the area and would help to piece together the patterns of early human settlement on the coast of North America. "This article details the discovery of footprints on the west coast of Canada with associated radiocarbon dates of 13,000 years before present," says Duncan McLaren, lead author of the study. "This finding provides evidence of the seafaring people who inhabited this area during the tail end of the last major ice age." There are other areas of archeological research that are disproving the land bridge hypothesis. No dispute of the footprint, just the potential dispute/enhancement of the potential 'why/how' of the footprint. The potential for the origins of the given indigenous population might be that of pacific boat travel. Evidentially speaking...this has come up archeologically, in the past decade, to a very powerful degree. Strong data sets pointing in this direction are appearing as of fairly recent.